A screenshot of the low-poly environment with realistic textures. DELTA team members working on this project include Instructional Designer and Project Lead Jakia Salam, Multimedia Lead Ben Huckaby, Video Production Lead Arthur Earnest, Lead Project Coordinator Laurie Gyalog and Technology Support Technician Michael Castro. The team is also assisted by part-time Developer Stephen Waddell and Environment and User-Interface Artist Matthew Castro. As part of an exploratory grant project for Landscape Construction, Materials, Methods and Documentation (LAR 457), Postdoctoral Research Scholar Muntazar Monsur and Teaching Assistant Professor Carla Delcambre from the College of Design are working with a team of dedicated DELTA staff members to create an immersive, 3D environment that students can explore using virtual reality (VR) headsets. 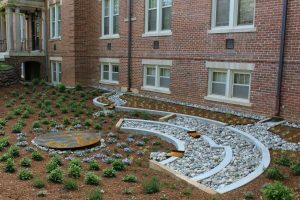 The completed rain garden at Syme Hall. The main deliverable of this project is an immersive, 3D environment built in the Unity Engine that can be explored using a VR headset. Embedded in the 3D environment will be several short videos demonstrating the building process at different sites such as the Syme Hall rain garden and construction at the Avent Ferry Complex that is still ongoing. There will also be a WordPress site hosting a browser version of the environment and a collection of resources, such as case studies, models and drawings of past projects. The project will be fully deployed by September 2018. Delcambre has been teaching LAR 457, a five-week summer course, for more than seven years. The purpose of this course is to help students understand various landscape architectural concepts, such as the application and use of sustainable materials, green infrastructure techniques and commonalities between abstract design and physical realities. Monsur and Delcambre began working together as part of the College of Design’s Natural Learning Initiative (NLI) team. They were inspired by the capabilities of VR technology to enhance student learning after seeing the success of other DELTA grant projects, including Monsur’s work with Research Associate Professor Nilda Cosco creating an interactive map tool with 360° videos. “Muntazar approached me and wanted to integrate the exploratory grant within this course,” said Delcambre. Work on the project formally began on September 1, 2017. Initially, Monsur wanted to create a “virtual field trip” of a real site using 360° videos students can view through a VR headset. “The field trips are really important for students to go out and see how design is translated into real construction,” said Monsur. However, it proved to be challenging getting the timing of shoots aligned with days students were out working on the sites. Other complicating factors, such as unpredictable weather and construction delays, also hindered their progress. Monsur decided that they would create a completely simulated environment with viewable 360° videos within it. “The main goal is still the same, [which is] trying to understand how abstract design is constructed in reality,” said Monsur. Design + Build students pouring concrete into molds at the construction site for the Syme Hall rain garden. The DELTA team was able to record several videos of students taking the Design + Build Studio (LAR 500) course, co-taught by Delcambre and Assistant Professor of Practice, Jesse Turner. These short videos will be viewable within the VR environment as hot spots demonstrating the process of moving from a design to construction of a 3D object. These videos combined with the VR environment will allow students to get a similar experience without physically being at a specific site. They will be able to select different areas to watch videos documenting the construction process as they move around the 3D space. What is exciting about this project is that it is DELTA’s first simulated VR environment viewable through a VR headset. “It is something we haven’t done before,” said Huckaby. DELTA has completed several projects involving 360° videos in the past, but has never constructed an immersive, 3D environment with VR headset capabilities until now. Spherical videos are considered a form of VR when viewed through a VR headset, but the viewer is not able to move freely within a 3D space. “Another key difference is that 360° video is static content—once it is recorded, that is what you get,” said Huckaby. According to Delcambre, landscape architecture students often have trouble visualizing their 2D drawings as 3D objects. Many do not have experience working with different landscape materials and seeing how they fit together. “You lack that mindset since you’re not the one building it,” said Earnest. Monsur and Delcambre hope that creating an interactive, simulated environment will allow students to become familiar with different materials and methods, especially international students, who have to adjust from metric measurements to feet and inches. “Several of our international students during the Design + Build [course] said they had drawn a particular detail several times and didn’t understand what the material was,” said Delcambre. This simulated environment will allow students to view different structures and materials throughout the course, making it easier for them to visualize moving from a drawing to a constructed object. The models they are building in the 3D environment will also showcase different forms of sustainable infrastructure. These designs focus particularly on how water moves through an urban landscape. 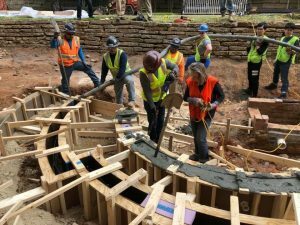 The design will include stormwater control measures (SCMs) such as rain gardens and structural soil which helps filter water as it moves through the ground. There will be a version of the 3D environment for viewing in class with a VR headset, but for those who cannot be physically present in the classroom, they can also access the web version. 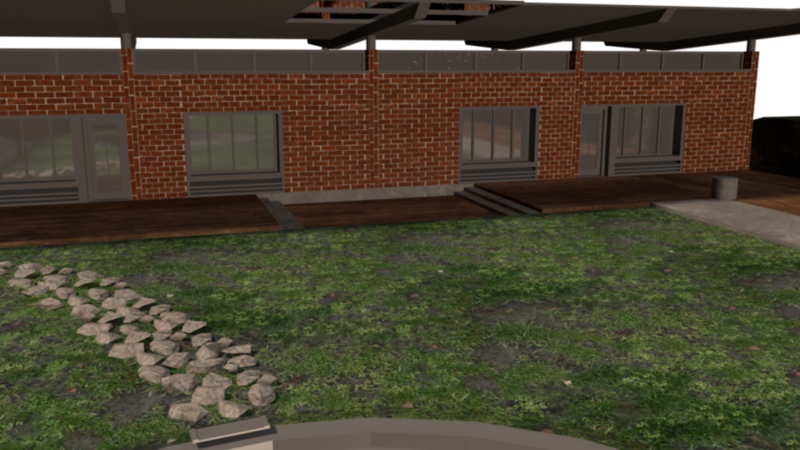 Delcambre hopes the web version of the immersive environment will be helpful for distance education students who take landscape architecture courses. “If you’re not using a headset, or you don’t have a lot of equipment, you can still experience it just from your web browser,” said Huckaby. Currently, the DELTA team is working on finishing up the VR interface. They plan to release a pilot version of the environment to be tested by Delcambre’s LAR 457 students in June 2018. 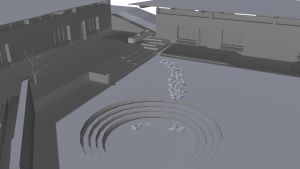 A screenshot of the low-poly environment before color and texturing is added. Since this is DELTA’s first project involving construction of a 3D environment for VR, the team has faced some unique challenges. The DELTA team takes high-detail models provided by Monsur and Delcambre and converts them into more efficient, low-poly models. “We need to be as efficient as possible, but we also want it to look really good,” said Huckaby. Finding the correct balance between quality and performance is a major challenge. The process of building an environment in Unity is also time-consuming. Prior experience developing simulations in Unity, such as creating a soil sampling exercise for HS 200, gave the team some familiarity with this type of work, speeding up the development process. The team can also save time by reusing 3D models provided in Unity model packages from previous projects for objects like trees and other plants. However, they have to design their own 3D models of any structure or object not included in these packages. Monsur and Delcambre hope to expand the project after it is completed. “We have students that want to learn more [about] VR,” said Delcambre. “It would be fantastic to have [more of] that type of learning happening in the College of Design.” She wants to incorporate VR into her introduction to landscape architecture course. Monsur and Delcambre intend to apply for another DELTA grant in Spring 2019. They believe the 3D environment can be used for horticulture, geospatial, natural resources and civil engineering courses as well. On the website, Monsur and Delcambre will be able to share their designs, pictures, videos and construction projects with other professors and students. The DELTA team sees their work serving as a touchstone for future VR projects. “One of our goals is to break new ground with VR development since that is something we haven’t done before,” said Huckaby. This spring, DELTA ran a six-week webinar series to explore important issues related to teaching with technology. Check out our six recorded webinars to hear faculty perspectives and gather ideas for your courses. When Justin Post joined the 2018-2019 class of DELTA Faculty Fellows, he brought along years of experience in teaching with technology. 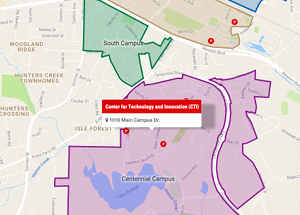 Now, he’s taking on projects to enhance online learning throughout NC State. Hear how he innovates for student success in our latest Faculty Fellow feature.